Have you ever read a recipe quickly, thought it was one thing, and then realized just when you’re about to put it in the oven that it’s not at all what you thought it was? On a completely unrelated note, it’s strawberry season so I made chocolate chip strawberry shortcake. I most definitely did NOT think this recipe was for an all chocolate shortcake, which had absolutely nothing to do with the fact that the original recipe was called “Chocolate Strawberry Shortcake” and also lacked a photo. Ok, so maybe I thought this would be an all chocolate strawberry shortcake. It wasn’t until I had mixed all the ingredients together that I realized, “Huh. This isn’t chocolate after all.” But it turned out to be a happy accident, I think. In addition to the bourbon chocolate sauce (which is just like WHOA), an all chocolate shortcake would have overwhelmed the delicate flavor of farm fresh strawberries. 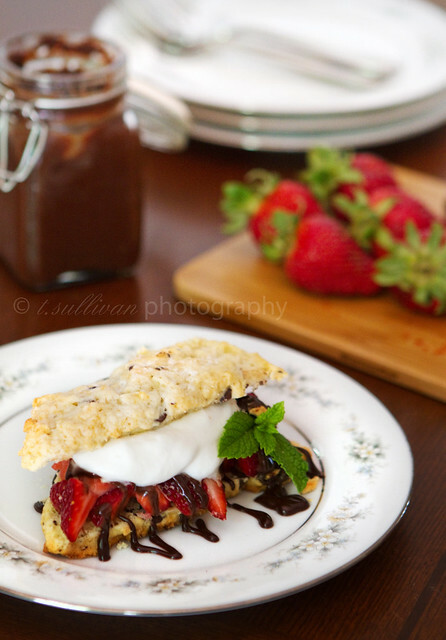 This shortcake studded with chocolate chips was the perfect balance – a nice hit of chocolate, but you can definitely taste the strawberries. Oh, and believe me, strawberry shortcake is better with chocolate. This shortcake can be made in a number of shapes and sizes – bake it in a 9-inch cake pan for one large shortcake to feed a crowd, or pat it out and use a biscuit cutter or cut into wedges for individual shortcakes. These shortcakes are best consumed the day they’re made. Preheat oven to 375°F. Butter and flour a 9-inch cake pan or spray with baking spray (if making one big shortcake), or line a baking sheet with parchment paper or a Silpat (for individual shortcakes). In a large bowl, whisk together flour, 3 tablespoons sugar, baking powder, baking soda, and salt. Add butter and smush between fingertips until mixture resembles coarse meal. Add 2/3 cup buttermilk and vanilla extract, stirring to form a dough. Fold in chocolate chips. If using a cake pan, transfer dough to cake pan a gently press to level top. If using baking sheet, dump dough out onto parchment paper and pat out into a circle about 1-inch thick. Cut into wedges or cut with a biscuit cutter and place on baking sheet about 2 inches apart. Brush top with remaining 2 tablespoons buttermilk and sprinkle with remaining 2 tablespoons sugar. Bake until lightly golden brown on top and a toothpick comes out clean, 15-20 minutes for small shortcakes, 25-30 minutes for one big shortcake. To make whipped cream, combined whipping cream, sugar and vanilla in the bowl of a mixer. Beat with whisk attachment until soft peaks form. Cover and chill until ready to serve. To serve, cut shortcake(s) in half. Spoon strawberries and their juices on top. 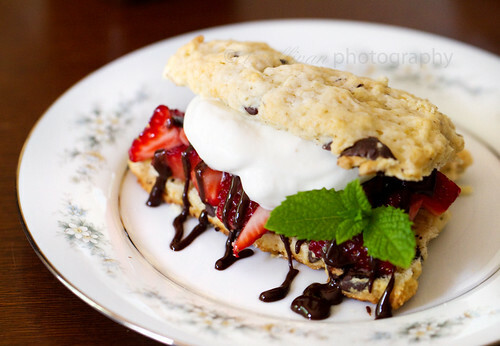 Drizzle with bourbon chocolate sauce, add whipped cream, and top with other half of shortcake. I made regular shortcake last night sans chocolate & it wad pretty great but I have to admit the chocolate looks super tempting! Wow, I would’ve never thought to mix chocolate and strawberries but it looks so good! I’m definitely missing out! I’ll have to try this! This sounds absolutely delicious!! I want to make it and eat it right now. Though unless it is just to early in the morning and I have missed it, where is the recipe for the Bourbon Chocolate Sauce?